Four Cylinder Perkins, 1004-42T 4000 cc., NATURALLY ASPIRATED, "Quadram" direct injection for the highest energy savings and environmental respect, water-cooled. Max. Power (DIN 70020) - 65 KW (88 HP) at 2400 R.P.M. Max. Torque 291 Nm at 1400 R.P.M. 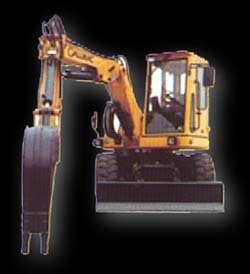 Either bulldozer blade or two fore outriggers on the side excavator version. Two central outriggers more (on demand). Each outrigger is independent from the other and is electronically controlled. 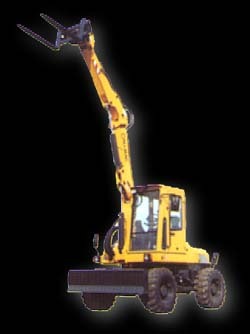 The windows all over the cab, including the ceiling, grant the complete view in all directions, and the opening of the door and the window on the rear side offer the aerification. 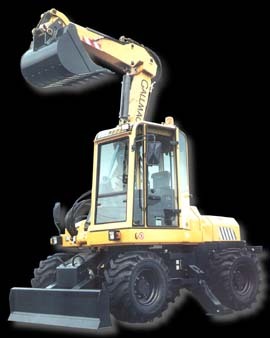 The driver and maneuvere comfort is given by the ergonomic seat and by the regulation depending on the weight and height of the operator; moreover by the checking instruments of the lighting system both for the traffic and for working. 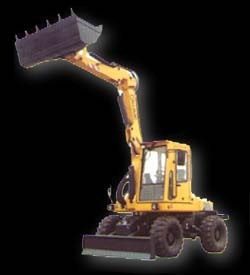 The front windshield wiper with electrical glass-washer, the rotating lamp, the rear view mirror complete the side excavator equipment of this machine.